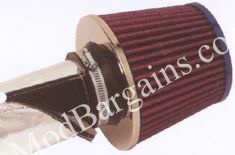 Do you already have that aftermarket cool air intake system but are still looking for more performance from it? Look no further, a Cool Intake System Reflective Shield will optimize performance from your intake by reflecting heat within your engine bay. Cooler intake temperatures result in an increase in horsepower, because cooler air is more dense then warm air, allowing the mixture to burn more efficiently. The shield has an adjustable diameter, ranging from 3" to 4", and will fit most aftermarket intake tubes. 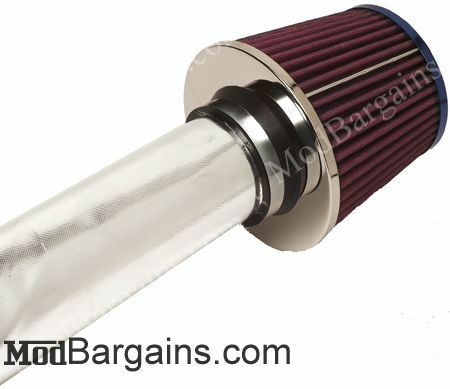 The shield cuts easily and is easy to keep clean, allowing you to have an appealing engine bay. To ensure your intake tube is protected from horsepower robbing heat produced by your engine, the shield will withstand 1100°F of radiant heat, and 500° of direct heat. The reflective shield will fit most cars and trucks that have an aftermarket intake that has a tube diameter ranging from 3" to 4". The Cool Intake System Reflective Shield goes on in just minutes and is very easy to install, even if you have no mechanical experience. The Shield also comes with foil tape (1"x3') to complete installation.